This contract proved to have some unique difficulties. The property, a beautiful house, was set back from the road, on a narrow lane. It was inherited by our clients from an estranged uncle, who was a bit of a shut in and a hoarder. 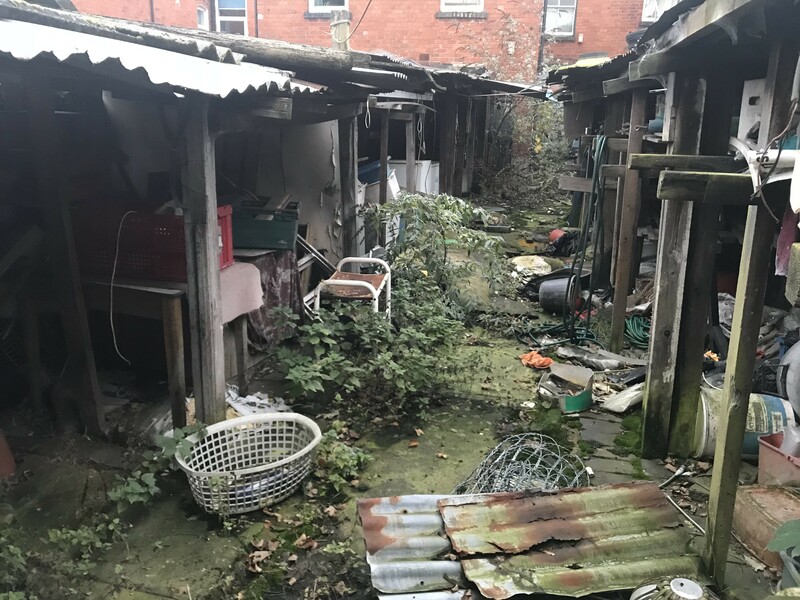 The home, which was filled floor to ceiling with rubbish was difficult to access with lorries; therefore much of this clearance was conducted with wheelbarrows and elbow grease. Our client initially hoped to sell the home once the Henley-in-Arden clearance made the place a bit more presentable. Arriving bright and early, our team began first with the garage as it would provide a staging area for the rest of the clearance. The garage, which was the least cluttered of the buildings, contained an old Triumph motorcycle amongst the boxes of rusting tools, milk crates full of mason jars, and bin liners full of moulding clothing. The attached loft contain a great deal of copper piping, a rarity these days. After completing the garage clearance, our team prepare for their next task; the house itself. We started first by removing everything that was clearly disposable. The previous tenant had kept every Warwick Courier, Daily Telegraph, and Guardian from 1981 until present – quite the feat. We were happy to be managing a potential fire hazard. As we moved through the house we discovered numerous hoarded items, including four televisions, six computers, four refrigerators, several half compete sets of encyclopaedias, and over six hundred books. As we moved up stairs we discovered several hardwood beds, and four toilets (all in working condition, and again highly desirable as they use more water than modern variants). Once the house was cleared of rubbish, and all potentially resalable or valuable items were moved to the garage, we began removing the soiled shag carpeting from the property. As this was pulled out we discovered beautiful hardwood floors under many of the floors; dramatically increasing the resell value of the home. Room by room we progressed, turning what was once a cluttered mess into a beautiful open space. The clearance was completed by the late evening. Our clients reaction to this Henley-in-Arden house clearance was heart rendering. They walked around the newly opened space smiling in awe. What had once been a depressing reminder of a loved ones reclusively was now a beautiful property. Many of the items that found were redistributed to the community; the books to the library and furniture to goodwill. Upon seeing the potential of the space, our clients opted to refurbish the property. They now hope to move in by the end of the year. Do you require a Warwick House clearance? We are available 9am to 8pm Monday to Sunday and have years of experience in the closer areas including Dorridge, Knowle, Bickenhill and Meriden. Please don’t hesitate to get in touch, we’re a sympathetic professional service running for over 30 years with experience in a multitude of housing types.